PAMACC News: MY AFRICA: WHO IS TELLING YOUR CLIMATE CHANGE STORY? MY AFRICA: WHO IS TELLING YOUR CLIMATE CHANGE STORY? LISAKA, Zambia (PAMACC) - Through no fault of their own, millions of poor and vulnerable people’s lives around the World, mainly in Africa, are at stake in the advent of climate change. Contributing only less than four percent to global carbon emissions, climate experts are unanimous that Africa is the most vulnerable to negative effects of climate change due to limited resource capacity. The conclusion is therefore that the poor and vulnerable communities of Africa need climate justice. Those who have been identified as major polluters are called upon not only to cut their carbon emissions, but also provide funding for adaptation strategies by the vulnerable communities. Dogged by a poor financial resource base, editorial challenges and limited understanding of climate change technicalities; the African media seems to have left the climate change reporting agenda in the hands of international media corporations. But is the international media interested in pushing the African climate justice agenda? As it is said that money is the root of all evil, the question that remains begging is the source of funding which determines the independence and impartiality of the so called international media. A theoretical perspective reveals an independent outlook. But a deeper reflection tells a different story. Funded by the Foreign office of a developed (annex one) country? Who then controls the foreign office? The answer may not need to be verbalised. In any case, it may not be necessary to open an international foreign policy debate. “Africa’s general poor planning and infrastructure does not help its cause to cope with frequent disasters”, read one of the headlines on one of the renowned International media during a flood disaster in one of the African countries in the 2011 rainy season. As opposed to highlighting the major causes of such flush floods that have become frequent resulting from climatic related changes, the story concentrated on the poor infrastructure, which failed to cope with too much water, leading to the submerging of houses and damage to property in the affected areas. This has unfortunately become the major characteristic of most International media stories on the negative effects of climate change on African communities. Whether by design or otherwise, the stories tend to concentrate on the blame game based on African countries poor capacity to cope. While it is, to a large extent, true that most African countries do not have clear policies on environmental sustainability and management; experts believe it is not the only side of the climate change discourse that needs to be told. What about the causality story and the reluctance by developed (Annex one) countries to commit to emission cuts? This, Annex two countries, argue, is a major dimension of the climate change narrative which has to be told in totality and its anticipated consequences highlighted. Resulting from this background, the Pan African Climate Justice Alliance (PACJA) believes African Journalists have a critical role to play in telling the African Climate Change narrative as it is. PACJA, a consortium of over five hundred civil society organisations working in 43 African countries, has been critical of the reluctance by developed nations to commit fully to carbon emissions cut and climate finance support. PACJA Programme Manager, Samuel Ogallah says African Journalists should not wait for international media to set the agenda of developed countries. “They are offering us all sorts of solutions. They are telling us to develop our economies using a green model when they did theirs in a brown way. Their media is all over telling us to adopt renewable energy models, but who owns these solar energy companies? It is about time we tell them to act and own up, retorts Ogallah. The question as to what African Journalists should do to nullify the negative picture and propaganda on the African climate change discourse, was heavily debated during a recent media training workshop in Nairobi, Kenya, organised by PACJA. One Journalist raised the question considering that most media outlets are western based and that African Journalists who string for such media agencies have no option but to push their agenda. He who pays the piper calls the tune. Amidst high poverty levels on the continent, an African journalist may be reluctant to stand by his/her story idea. What is pitched turns out to be the opposite of what is finally published. The idea generator unfortunately becomes part of the inquisitive audience in trying to find some semblance of what was originally proposed. The consequence is that subsequent story ideas are deliberately pitched against one’s belief and community realities for fear of being a writer relegated to a group of curious audience members (from being part of the editorial team to a group of readers/listeners). Another Journalist proposed the African civil society as the solution to the dilemma. But the proposal was met with a categorical NO from some members of the gathering. As vocal as they are known to be against their governments, civil society organisations also do not seem to have the power of attorney in their hands. It goes back to the question of resources. Who funds the African civil society? The answer, well, is better left for another day. The bottom line though is that, they, too, have a limit! How then, will mother Africa push her agenda when she is not in control of resources? 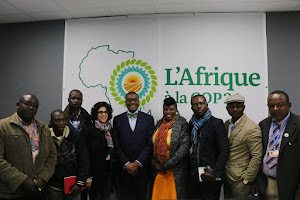 The subsequent deliberations on the subject saw the birth of the Pan African Media Alliance for Climate Change (PAMACC), to push the African climate justice agenda with passion. While it does not have control over resources, Africa has some control over Passion. My Africa; who is telling your climate change story? PAMACC! Are you the solution? Vulnerable Africa is surely banking on you; or else, poor planning and infrastructure headlines will continue to dominate, at the expense of the fact that global carbon emission levels have gone above the 400 parts per million which was set as a limit threshold. Good initiative, but we should be careful with some of the conclusions we make. You assert that "As opposed to highlighting the major causes of such flush floods that have become frequent resulting from climatic related changes..." Are you suggesting that climate change is the major cause floods in Africa? That is debatable and not supported by the science (please refer to IPCC SREX, published last year). I believe climate change is real, and Africa will be negatively affected. But I refuse to believe that the frequent floods (granted the frequency has increased) can be blamed on climate change or climate change singled out as the major culprit. What about the expensive building we are putting up in water courses? What about the choke gutters and poorly constructed gutters? Yes, climate change MAY play a role, but we need to do more by ourselves in terms of preventing some of these UNnatural disasters. as the author of the article above, I have to say many thanks Brother for the observation. Am really grateful for your insights and observations. But what do you mean that " frequency of flash floods is not supported by science? Here is a scientific fact "One of the most common incidences of flash flooding occurs when there is a heavy period of rainfall following a period of drought. This is because the ground is very dry and cannot absorb so much water at once. Then when the torrent of water comes, it cannot be absorbed into the ground and spills over and when rain keeps persisting in such a way, it can wash away land and cause great damage to buildings (in a flash flood)." The two weather extremes (drought versus too much rainfall) are known to be the result of global warming. I have ably highlighted the challenges that Africa has regarding environmnetal policy which relates to the issues you raise about building in water courses and poor infrasstructure.There is no arguing that Africa is poor on that front. But the argumnet is that it is not the only side of the story to be told on climate change, what cuases it (carbon emmissions) should also be highlighted and action taken. Once again, am grateful for your observations. Peace to Mother Africa!